11 Beauty Benefits of Bone Broth for Skin, Hair, Anti-Aging & More - beautymunsta - free natural beauty hacks and more! 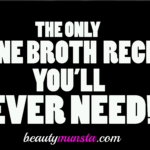 These beauty benefits of bone broth will stun you! You need to add this beauty-boosting food to your diet ASAP! Although bone broth is only now getting all the hype like most other superfoods, it’s been consumed for ages in many traditional cultures around the world. When I was a kid my mom made me bone broth and my mom’s mom made her bone broth too! Bone broth is made by cooking bones that have been roasted first and still have connective tissue and skin. You can find such bones (soup bones, goat/beef knuckles, etc) at the local butcher’s or wherever they sell meat. Make sure to buy from organic grass-fed sources. Bone broth is cooked in a way that the bones can become extremely soft that you can easily chew and swallow them. All the nutrients in the bones and connective tissue are leached into the broth, which makes it a super nourishing nutrient-rich food! Our bone broth recipe is the simplest and it’s the only one you’ll ever need! It contains the regular vegetables for broth and just a few spices but it’s so flavorful, we use the same recipe every single time. The best and fastest way to make bone broth is using a large capacity pressure cooker. 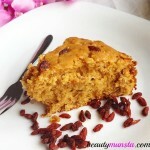 You do not need to cook it for a long time at all! 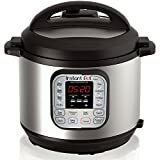 When you use a pressure cooker, you’ll get perfectly nutritious and delicious bone broth in the quickest time possible. Collagen – The main nutrient in bone broth for skin, hair and nails is collagen! Bone broth is loaded with collagen, a protein found in the connective tissue, cartilage, bone marrow, tendons, ligaments and bones of cows, goats, sheep and other vertebrates. Collagen is what maintains skin elasticity and firmness as well as promotes smooth and supple skin. Protein – Protein is not only a building block for muscles but it’s also a vital nutrient for healthy and strong hair. Magnesium – By warding off pro-aging free radicals, magnesium prevents pre-mature aging. It also reduces breakouts by staving off acne-causing bacteria as well as minimizing acne inflammation. Calcium – Did you know that calcium deficiency leads to dry skin, brittle nails and dull hair? Calcium is necessary for healthy and moisturized skin and bone broth, which is made using calcium-rich bones, is rich in this vital nutrient. From anti-aging to longer & stronger hair, here are 11 of bone broth for skin benefits, as well as hair and other beauty benefits! Enjoy a bowl of bone broth at any time of the day and say hello to a more radiant and youthful you! Ditch the expensive collagen creams and take dietary collagen in the form of bone broth instead for youthful skin! Bone broth is super rich in collagen, which is broken down to form gelatin. Gelatin heals inflammation that leads to aging, reduces skin roughness, improves skin elasticity and keeps skin supple and wrinkle-free. Consuming bone broth will give you a healthier head of hair with lustrous locks and a moisturized scalp but did you know that it also promotes hair growth?! The gelatin in bone broth helps promote healthy and moisturized cuticles and nails. 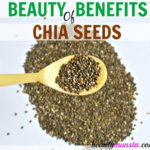 It also promotes nail growth and strengthens them. If you have weak, brittle and soft nails, no need to take supplements! Simply include bone broth as well as eggs, fatty fish and nuts like almonds in your diet. Yes, bone broth will help you get rid of cellulite and attain smooth & flawless skin! Contrary to popular belief, cellulite does not come because of excess fat – even slender people can have cellulite! Cellulite is brought about by lack of enough connective tissue as well as build-up of toxins/clogged up lymphatic system. Bone broth not only increases the skin’s collagen but also helps flush out toxins which all help reduce cellulite. Inflammatory skin conditions including eczema, psoriasis, acne inflammation, rosacea and others can be reduced and naturally healed by drinking bone broth. 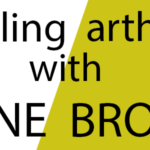 The amino acids found in bone broth are powerful anti-inflammatory agents, which will soothe the inflammation, make it appear less noticeable as well as speed up healing. Do stretch marks ever fade? Yes, they do. Include collagen-rich foods in your diet! As you already know, bone broth contains a lot of collagen, which is broken down into gelatin in the cooking process. Collagen is what keeps our skin elastic and it helps maintain our skin’s structural integrity. Eating collagen-rich foods like bone broth boost collagen production and prevent and fade away stretch marks. The high levels of natural collagen help boost the skin’s collagen and improve the skin’s elasticity thereby keeping it taut and firm. If you’ve tried changing your diet, all the anti-acne creams on the planet, et cetera, et cetera, and you’re still plagued by acne then maybe it’s time to start drinking bone broth. One major cause of acne is poor gut health including constipation, IBS, leaky gut and slow digestion. 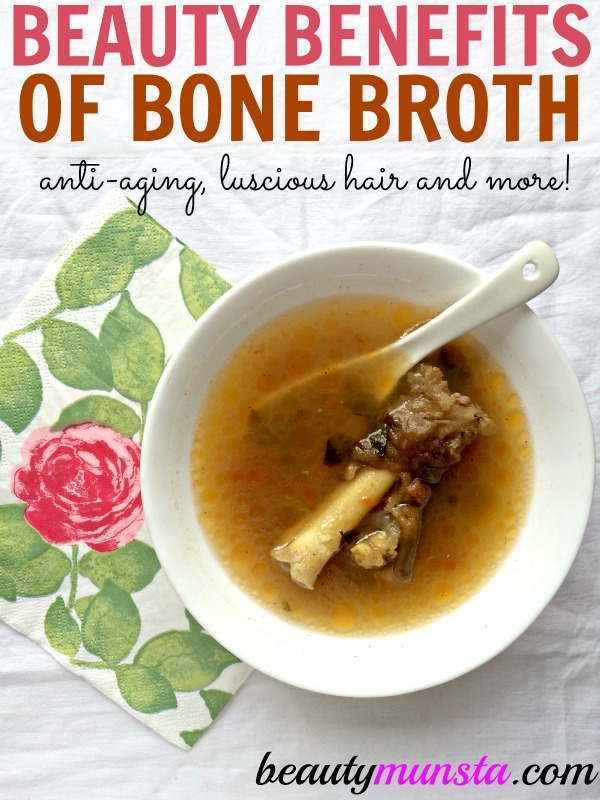 Clear your gut issues by consuming nutrient-rich and easy to digest bone broth! Gelatin in bone broth heals leaky gut and IBS as well as regulating bowel movements and flushing out toxins that pop out of the body as pus-filled acne. Collagen is necessary for healing scars and blemishes. A diet lacking in collagen and protein can delay healing of scars which is why some people have scars that can take years to completely heal. Protein – mostly from animal sources, is necessary for repairing worn out tissue as well as damaged skin cells. Glutamine and argine are two important amino acids found in animal protein that help in collagen formation in the body. Bone broth contains all these nutrients so drink up for a blemish-free face and speedy scar-healing! Do you have dark spots, flaky skin, acne scars, dark marks and an uneven complexion? The nourishing nutrients in bone broth, including hyaluronic acid – found in bone cartilage, coupled with collagen contribute to healthy looking skin by preserving moisture in cells. Healthy, white and shiny teeth naturally enhance beauty and make a person look attractive! Keep your teeth strong, healthy and free from cavities by consuming calcium, magnesium and phosphorus-rich bone broth. As with everything, consume bone broth in moderation and please ensure to get your bones from organic and grass-fed sources! If you’re wondering how much bone broth to consume daily, please read: How Much Bone Broth Should I Drink Daily? 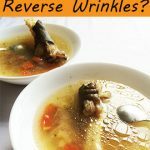 Can Bone Broth Reverse Wrinkles?